Big news!..., 1 TFA FOTK armor set and Riot Shield on order with KB Props! Should have some BBB pics in 3-4 weeks. Waiting years!?! I’ll be old by then. Thank you. I have an install demo, with sound clip, of a “different” helmet displayed on my Facebook page. There is still some prep work to do to my FO helmet shell before I can demo it and share it with everyone here. Yup, the gmail email did the trick. Received the confirmation email immediately and notifications are arriving as well. I’m also working on helmet bags. But at this time I need local volunteers for tests experiments. The fan is powered by 3 AAA batteries (4.5v). I wanted a unit that fit in the middle of being quiet, light weight and still moved a decent amount of air. It weighs in at a mere 1.8oz/51.5g, 3oz/87.5g with the batteries installed. It’s speced at 25 dBA and 3.75 CFM. The fan resonates a little louder once mounted but you can still easily carry on a conversation. As for the flow, any bend you put in the corrugated ducting will reduce flow. Yet testing on a heavily fogged lens cleared up in seconds and never fogged back over. I include two EVA foam shims to help with shaping a level mounting area, as well as Velcro for final mounting. The V6 is $37 delivered within the US. I failed to look into shipping world wide, so at this time I don’t have a price for that. I designed the V6 to fit in a FO helmet. I’ve since installed it in a TK helmet and a tight fitting Iron Man helmet. 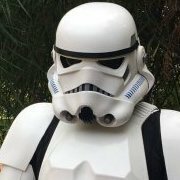 Since working with TK-42134 I decided to make the unit available for other Troopers and to turn all profit into purchasing and building my own FO armor. I did a little research in incoming email settings and now I understand what you’re saying. Darn Apple has to do things different . Thank you for looking into it, if you come up with anything please toss me a note. In the meantime I’ll open a gmail account so I can get notifications from here. Here’s a pic of an early unit. I call it the V6 (Vent 6). She includes a switched battery pack and blower fan with 6 flexible ducts. Thank you. That’s why I asked. Just wanted to offer a universal installation for those who double, triple or cross-costume with Imperial Guards, Scout Troopers, Vader or helmets outside the FISD. Had trouble again with my “iCloud” email address. I tried my personal email (also an iCloud email address) which I’ve never had an issue with, but it failed as well. So I borrowed my girlfriends email (gmail) and the confirmation email landed immediately. Does this site accept Apple (iCloud) email addresses? Hi all! Thank you for the warm welcomes! Thank you so much for the info and links on the product sales and FO build info. I have a price delivered ready, however, I didn’t figure in going world wide (Thank you for pointing that out, Joseph). I have a photoed install with details ready to share, but, it’s in my Iron Man helmet. If that doesn’t offend anyone here, I’d be happy to share. My first two prototypes were installed in FO helmets, but again, they were prototypes. I’ve also installed a prototype in an TK helmet. I can, and will photo an install in my third FO helmet, however, the Iron Man helmet was most challenging and shared options for odd helmets.